Over the years, Sears has licensed several different Mamiya cameras, and there is also one from the NC series. 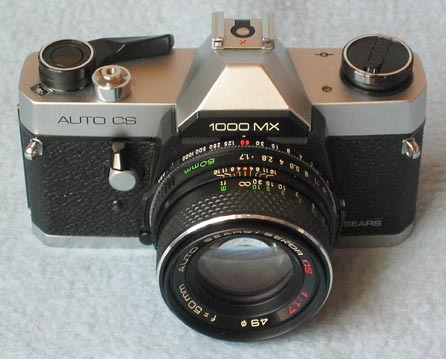 Sears named the camera “Auto CS 1000 MXB”. 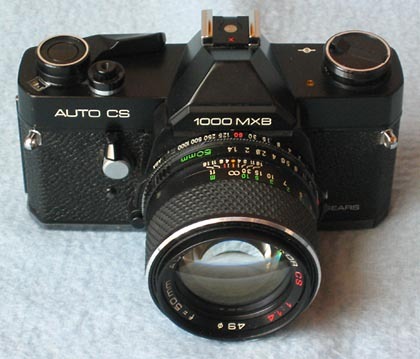 The 50 mm 1:1.4 or 1:1.7 lens which came with the camera was called “Auto Sears/Sekor CS”. There were also some other CS lenses licensed by Sears (I do have such a 28 mm lens and a 135 mm lens - not sure if any other ones were also licensed). Of course, the lenses are original Mamiya products with just a different name on it. The camera body is based on the NC 1000 model (no film memo pocket on the back). These licensed cameras by Sears are based on the Mamiya NC1000. The black version was called “Sears Auto CS 1000 MXB” and the silver version “Sears Auto CS 1000 MX”. Every once in a while, you can see one of these cameras up for auction on eBay. It is not really a Mamiya NC series camera, but for the die-hard collector these license models are also of interest. They usually don´t sell for a very high price (around US$ 50 to US$ 75). The only difference to the Mamiya NC 1000 besides the printed model name is the lever for the self-timer which looks slightly different. The black version is called 1000 MXB (B = black) and the silver version is called 1000 MX. I have no idea during which period these cameras were actually sold at Sears. In case somebody has some additional information on these cameras, please let me know and contact me via e-mail. Thank you.